Click on Packet 3 for NEW PAGES! 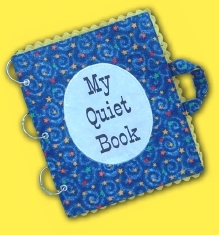 Looking for Quality "Quiet Books"? Enjoy viewing my sample pages. Click on the buttons to see packets. 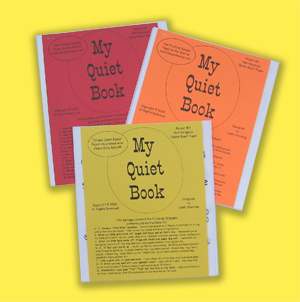 I have enjoyed many years of making Quiet Books. I love teaching children. Because of this book's design (removable pages) many children can share the same book. Pages are made with Heavy Duty Pellon® Stabilizer. A durable fabric that is easy to sew and color on. Pages are 9 1/2" x 11" and include many activities such as, "I Spy" bags, zippers, treat pockets, color and shape match up, counting, read numbers and color words, senses, sewing/lacing cards, sorting hot/cold, glove finger puppets, braiding, tying, pellon finger puppets, girl/boy to dress, animal heads mix and match, ABC's, telephone and many more to come in the future. Quiet Books are treasured memories that children remember the rest of their lives. Each packet includes 10 pre-printed Pellon® pages and pieces, detailed instructions and well marked patterns. You will need to supply your own felt and fabrics. You will also need more Heavy Duty Pellon® Stabilizer (# 65 wt.) and Heavy Duty Wonder-Under® to reinforce page pieces. I have these two materials in packets (with the needed yardage) that can be purchased. Pellon® and Wonder-Under® come in many textures and weights, and may be hard to find in your fabric stores, therefore I suggest buying them from me. Have your guests color the pages. This will be a treasured keepsake from all of her friends. (Optional; have guests sign their names to the page they colored). "My pre-school age grandchildren have been kept very reverent and busy with their Quiet Books during church meetings. The activities are so varied and educational as well as entertaining. I especially like the pages that remind them of stories from the scriptures. First we teach them the scripture stories during "Family Night" using the quiet book page as a visual aid. Then whenever they are on that page, they're reminded of its meaning. Since the pages can be taken out of the book they can be shared by several children at once." Quiet Book "Individual" and "Finished Pages"